BACKGROUND: Polycystic ovary syndrome (PCOS) is a common metabolic-endocrine disorder in women and is associated with a number of metabolic morbidities. We examined the association of PCOS and its components with socioeconomic status (SES) over the life course to explore the role of the environment on the development of PCOS. METHODS: Participants included 1163 women, aged 34-39, from the Coronary Artery Risk Development in Young Adults (CARDIA) Women's Study, examined at year 16 of the CARDIA study (2001). PCOS was defined according to the 1990 National Institutes of Health (NIH) criteria. RESULTS: Logistic regression models, adjusted for age, body mass index (BMI), waist circumference, and oral contraceptive (OC) use, demonstrated a statistically significant association between those women with low parental education/high personal education and PCOS (odds ratio [OR] 2.5, 95% confidence interval [CI] 1.4-4.4). CONCLUSIONS: Our results indicate that women who experienced low childhood SES are at increased risk of PCOS, but this risk is limited to those who have personally attained a high level of education. 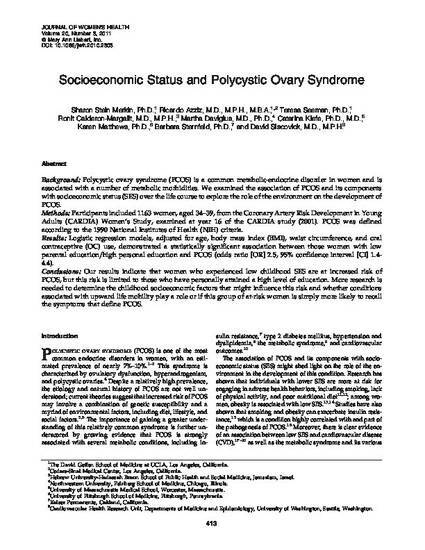 More research is needed to determine the childhood socioeconomic factors that might influence this risk and whether conditions associated with upward life mobility play a role or if this group of at-risk women is simply more likely to recall the symptoms that define PCOS. Originally published in the Journal of Women's Health 2011 Mar;20(3):413-9. DOI 10.1089/jwh.2010.2303. © 2011, copyright Mary Ann Liebert, Inc. and available online at: http://online.liebertpub.com.